The three-week-old Café Amaretto looks pleasing to the eye, with its predominantly white décor and minimalistic furniture looking inviting and comforting. I have been invited to an extensive tasting session by its young and energetic owner Shayal Taunk, herself an alumnus of St Xavier’s Mumbai and XLRI Jamshedpur, who decided to opt out and follow her dream of opening an Italian themed café. The food experience starts on shaky footing with the starters but comes on to terra firma with the mains and delights with the desserts. In starters, Ricotta Stuffed Mushrooms (Rs 390) are strangely sweet with not a very pleasant texture. Pan Fried Prawns (Rs 375) is fresh and lightly sautéed prawns tossed in garlic and chili herb lemon sauce. Though the prawns are cooked just right, the dish has a unidimentional taste without much character. 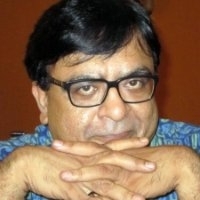 Assorted Bruschetta (Rs 230) are of three types but none of it is memorable. Also the bread is a kind of melba toast that does not give a good bite. Rocket & Poached Pear Salad (Rs 375) is a bit on the sweet side and is crying out for some touch of umami to break the monotony. Things start perking up with a simple dish of not so Italian Tempura Fish Fingers (Rs 295) that are crisp with melt in the mouth fish. Mushroom Cappuccino Soup (Rs 275) too hits the spot, with its crisp yet light taste. The thin crust wood- fired pizza, where I choose a half and half combination of Pesto & Pine Nuts and Green Apple & Gorgonzola (8’inch; Rs 460) is good too, though I would have preferred a bigger hit of blue cheese in the second half. The two main dishes I try are both good. Linguini Jalopeno with Prawns, Broccoli and Butter Lemon Chill Sauce (Rs 595) is cooked just right – with the pasta cooked Indian al dente (and not Italian al dente) and a light yet flavourful sauce. Grilled John Dory with citrus sauce, fennel, Kalamata olives, and tossed quinoa (Rs 795) with its tender flaky fish is delicious too. The desserts are next. Panacotta with Mango sauce (Rs 225) wobbles and tastes good enough to impress a Masterchef Australia judge. Salted Caramel cake with marshmallow (Rs 225) is good too. What is really noteworthy is the fact that I finally find the real, genuine ciabatta bread (Rs 85) in the restaurant’s bakery. I will certainly be back to buy this, as well as the promising looking whole wheat multigrain bread. 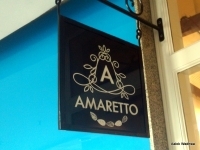 Café Amaretto has many things going for it. The interiors are warm and pleasant, the service is competent and food is by and large good, if you remember that the restaurant is very new and is going to be fixing its menu. 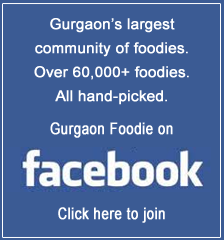 I wish them well, because in Gurgaon, good food is more often than not, found in small formats.